Last week I started a eight week pottery class in Williamsburg, and let me tell you, the first class was quite an experience. I don't think I have ever been so horrible at something in my life. I'd been wanting to take a pottery class for a while, with the hopes of making some ceramics good enough to use in my own cooking, and when my friend Nica asked me to take one with her I jumped at the chance. I'd done in a couple times in high school and really enjoyed it, and lately I've felt like I needed another creative outlet to focus on during the week after work. On Wednesday I went over to Williamsburg after work for the first class. We watched our teacher, Jake, explain some of the basics of working with clay, making pinch pots, coil pots, and finally the wheel. It was so mesmerizing watching him make a mug - the clay seemed to bend and transform at his will with just the slightest touch and I was immediately excited. "I'm going to make so many mugs!" I thought to myself. And then, I plopped down at my own wheel and began. And. It. Was. A. Disaster!!!! I am not kidding. First, I could not figure out how to put the buffer things around the wheel so the water wouldn't spill anywhere. And then I couldn't get my clay centered while the wheel was spinning. To do this you kind of have to lock your elbows into your knees and lean over the wheel with a lot of force. Jake came over and put his hands on top of mine, and it immediately centered so I was thrilled, but as soon as he walked away my clay started wobbling around again. Finally it started to center and I tried to make a little hole to start a bowl but it was all lopsided and clearly not going as planned. And then, I pressed to hard into the side and a strip of clay went flying off the wheel. I decided to just stop with the wheel entirely to avoid any further embarrassment. Clearly, this was not going the way that I had planned and Jake made mug-making look super easy. Luckily, I've been able to laugh at my experience during the first class. The next class is tomorrow night and I am hoping for some better results, but it's definitely going to be a (fun) challenge! This Dirty Chai Cake came to me in a vision a couple weeks ago. I am being serious! I was pondering how to make a dirty chai (for those of you who don't know that is a chai latte with a shot of espresso) and then I suddenly thought to myself "I wonder if I could make that into a cake?" Thus, this cake was born. 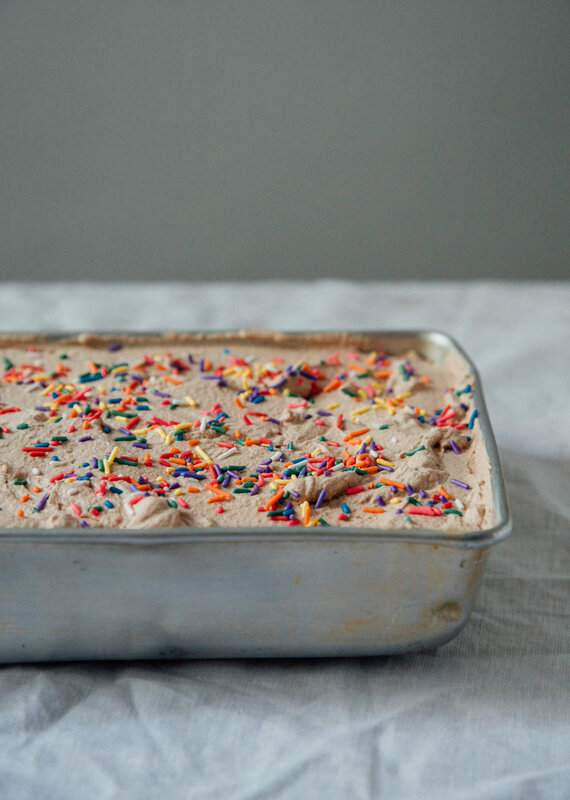 I have to say, the best part is the espresso whipped cream frosting, which is perfectly sweet and has an amazing coffee flavor. Pre-heat oven to 350 degrees F. Coat a 9x13 inch rimmed baking sheet with melted butter and set aside. Whisk the flour, sugar, baking powder, spices, chai tea leaves, and salt together in a large bowl. Add the eggs, butter, milk, and vanilla and mix with an electric hand mixer on medium speed until smooth. Pour the batter into the baking sheet. Bake until the cake is lightly browned and doesn't leave any batter behind when you stick a fork in it - about 25-30 minutes. Cool the cake on a wire rack while preparing the frosting. In a metal bowl, whisk together heavy cream, confectioner's sugar and espresso. With a hand mixer, blend until stiff peaks form.